One of the most common question we get is from new business owners inquiring about the differences between the online and the desktop versions of QuickBooks. The answer depends on the complexity or the simplicity of information they are looking to get from the system. If you are running a small medical office and just need to track your sales and expenses as they occur, then QuickBooks online is an excellent choice. If you operate a photo studio and only use basic functions such as invoicing or bill entry, then the online version will work well too. On the other hand, if your business requires job costing analysis or escrow account tracking like the kind used by attorneys, builders, architects, then the online version will not satisfy your needs. For businesses that need more complex and detail reporting options, we recommend the desktop version. QuickBooks Online offers remote access 24 hours a day, provided that your internet connection stays on. For small businesses this is a very convenient feature since so many business owners travel and need access to financial data anywhere, anytime. The desktop version stopped supporting remote access as of January 2015. Online edition of QuickBooks permits up to to 25 simultaneous users access the system, while the desktop version allows up to 5 users. However, the more expensive edition called QuickBooks Enterprise, which is used by larger businesses, does offers up to 30 users. This system is much more expensive and from our experience most small businesses only have a need for up to 3 users. QuickBooks software updates, which are periodic maintenance releases are automatically updated in the online edition. In the desktop edition users install it themselves upon logging into the system. Online edition upgrades, which are new software releases are free with the online version yet cost the full price of the software for desktop editions. We suggest using your desktop version for two years before upgrading. QuickBooks support is free for the online version while support for desktop is extra. QuickBooks online does not integrate with Intuit POS as the desktop versions do. Quickbooks online does not offer complete job or project costing reports although you can configure it to track expenses by job. It also lacks a lot of report customization features found in the desktop version. QuickBooks for desktop, especially the higher version like Premier or Enterprise offers multiple industry-specific reports which the Online version does not. Making sales is great but not if you can’t collect them on time or in in full. Unpaid invoices can wreck havoc on your company’s operations while slow payments cause roadblocks to profitability or impede your ability to pay bills. All in all, problems collecting A/R cost businesses money. But those who use QuickBooks software have excellent tools built within the program which are designed to help speed up invoice collections. 💡 Let customers pay invoices electronically and include the payment link on each invoice or statement. You can sign up with QuickBooks using their Intuit Payment Network service, which will deposit customers’ payments straight into your bank account usually within 1 to 2 days. 💡 Monitor your A/R regularly: Being proactive in business can mean the difference between being in the black or seeing red. One way to do this is by using built-in A/R reports especially designed to give you immediate information about who owes you money, how much and the aging on those invoices. Armed with this knowledge you can take action to collect your money more aggressively. 💡 Send statements monthly to customers who pay slow: sending unpaid statements has been reported to speed up payments on invoices because most people hate seeing these same reminders month after month. 💡 Send accurate invoices the first time: Few things will slow down your account receivables more than an invoice with errors. Customers who dispute charges usually wait until the due date and then get more days to pay them because it takes time to review and correct errors. 💡 Offer early payment discounts and assess late payment charges: How much are you willing to give up to speed up your invoice collection? That’s a balancing act which requires careful analysis. For millions of small businesses with big cash flow fluctuations, encouraging faster collections on unpaid invoices is a strategically effective alternative to keep the money coming, even at a cost. Conversely, assessing late charges and including them on customer statement reminders will often encourage faster payments. 💡 Input a credit threshold in a customer’s profile under the Payment tab so QuickBooks can automatically flag for potential bad debt losses. Once a customer has reached his/her credit limit, you can control or stop deliveries until payment is made. Customers who’ve been identified for “zero available credit” should have their names edited to “On Hold” until outstanding balances get paid off. 💡 State due date and late payment charges on all invoices so customers can’t be in the dark about payment due dates. Whatever approach you implement in your A/R collections, make sure that you are doing it consistently. Be firm with your customers about staying within the requred terms but also be fair. Nobody likes to deal with an unreasonable company. We encourage all our small business owners to use a computerized accounting system like QuickBooks to help speed up and manage A/R and cash flow more effectively. ➡ Did you know that QuickBooks software is the #1 most popular accounting system for small businesses? To find out why, email us for more information using the form on this page. Need help learning how to better manage your account receivables and speed up your cash flow? Call our experts for more information at (646) 660-1820. Monday to Friday 9:30am to 5:30pm. To properly record and manage your accounting through QuickBooks it’s important to know some basic terms. Chart of Accounts – It’s a list of categories also referred to as General Ledger accounts that are organized on a report to represent all the different classifications or ways of how your business uses or generate money. Every financial transaction will fit into some descriptive category which is listed on the “Chart of Accounts”. Terms – Is the length of time specifying when a bill or an invoice is due to be paid. Accrual Basis Accounting – This term represents the basic accounting principle of reporting income on all sales, collected and still unpaid and reporting expenses on the total of bills paid and still owed. Cash Basis – You report income only on sales actually collected and report expenses only on the portion you paid out. Need help navigating or understanding how QuickBooks software works? Please contact our office at (212) 537-9060 for more information. We service Manhattan, Long Island, Qeens, Bronx, Brooklyn, Westchester County, Rockland County, vicinity of Greenwich and Stamford CT and Bergen County, Essex County, Hudson County, Passaic County in Northern NJ. Asset – These are tangible or intangible economic resource that the company owns which can be converted to cash. In QuickBooks there are Current Assets which are less than 12 months, such as a short CD and Other Assets which are longer than 12 months such as a Note Receivable. There are also Fixed Assets which refer to tangible items like computers and equipment. Liabilities – These are your company’s financial obligations. Equity – A representation a company’s worth which is found by deducting liabilities from assets. General Journal Entry – These are entries usually reserved for accountants to record adjustments which cannot be easily recorded in QuickBooks. Item Receipt – Functionality within QuickBooks to record the receipt of inventory without a bill. Average Cost of Inventory – QuickBooks uses this method to figure out the average cost of inventory purchased and sold. Non-Inventory Part – Items you purchase for resale but don’t track as inventory. Job – This is a term QuickBooks software uses to classify separate projects or work-related activities for the same customer. Jobs can be used to represent properties, projects, legal cases and more. Reconcile – This is a method for ensuring that your and the bank’s balances agree. In QuickBooks you can easily reconcile by downloading transactions directly from the bank. Sales Receipt – A cash sale where payment is made during the transaction. Customer Statement – A record showing all the invoices and payments made for a specific date range along with the money owed allocated to different aging periods. 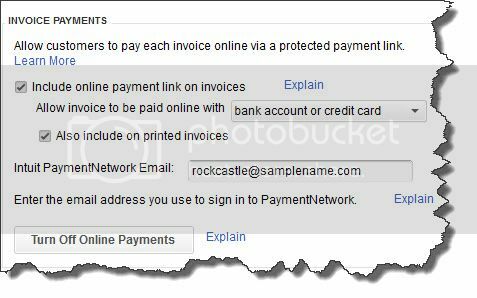 Accounts Payable (A/P) – Money you owe to your suppliers and vendors. Accounts Receivable (A/R) – Money you are owed by your customers. Vendor – In QuickBooks this term refers to anyone you make payments to other than business owners, partners, employees or customers. Cash Flow – A measurement representing net cash left over from incoming funds and outgoing funds. QuickBooks offers a couple of different ways to assess cash flow. Profit / Loss Statement – A report also called Income Statement which shows the net difference between sales and expenses. It can be generated on accrual or cash basis. Balance Sheet – A report representing the financial net value of assets owned by a business.